The Glass Cube Shelving Display is strong and versatile. Built with 10 in x16 in, 3/16 in. thick tempered glass, each cube measures at 10 in x 10 in x 16 in. Chrome connectors makes assembly easy. 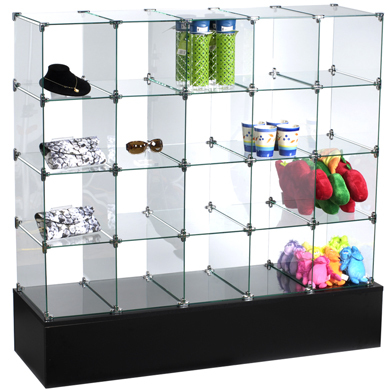 The glass cube display can configure to meet sales needs and floor space utilization. The display includes the glass panels and connectors, base sold separately. Search Glass Cube Base.